When you first move to a city, your first thought might be to ask yourself, “how do I make friends?” After you leave the educational universe and join the workforce, you don’t forget how to make friends, but you need to know where to find them. The first place to start is to join a local news source, or events newsletter just to find out what is going on in the city. The Evergrey is an immensely helpful community newsletter in the Seattle area whose tagline is “Live like you live here”. They have local news articles, which make it feel like a much smaller city, and the events list is always a great go-to for networking, educational events, and more. Classes and workshops are typically smaller in capacity and focus on something educational, so it is a wonderful place to find your people without direct networking pressure. 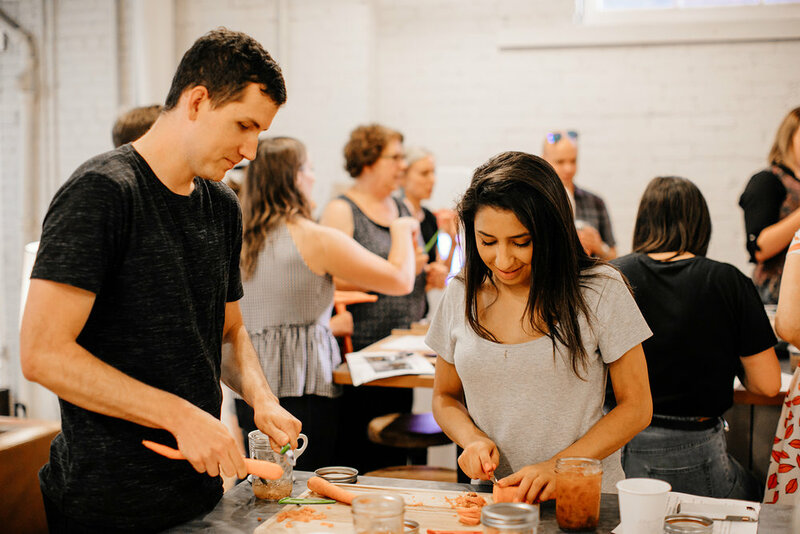 Foundation Community is fantastic new organization that hosts mostly classes and workshops, highlighting mindful interactions with the other attendees of their events. Coworking communities typically have a spectrum of engagement with their members. Some spaces focus mainly on the productivity of a quiet office space, others focus more on tackling loneliness through connections at community events, while others work on helping its members build their business skills and networks. Most coworking spaces strive to be the full package, however every one has a unique identity, and if you find the right community, chances are that you will feel a lot more “at home” in your workplace. As a Community Manager of MAKERS Workspaces, I deeply believe in the power of partnerships. Small businesses need to work together to help each other grow. By working with our members who share their skills through business development workshops, support groups, and free office hours, business growth feels more personalized and encouraged. Coworking spaces readily bring in inspiring business leaders and entrepreneurs to act as a reliable hub for knowledge sharing. Have you ever taken a deep dive into all of the business Meetup groups out there? It’s a great place to put yourself out there and find the people who might accelerate your connections. Sometimes individuals who you meet at these groups won’t be long lasting connections, but each attendee has their own connections, and a simple introductory email might just be the accelerator you need. I have found that by getting involved in business groups that I am passionate about, it has only taken one person who is deeply connected to put me in every single one of their spheres. As a female business leader myself, F Bomb Breakfast Club has been one of the most inspiring business networking communities I have been involved in. It is a group only for female founders and a place where you can “find your tribe”. The closed Facebook group is also highly engaged, which keeps the inspiration alive every single day of the week. Find a group that rallies around a mission you believe in. Volunteer, put time in, share your own skills, and the good karma will come back to you.